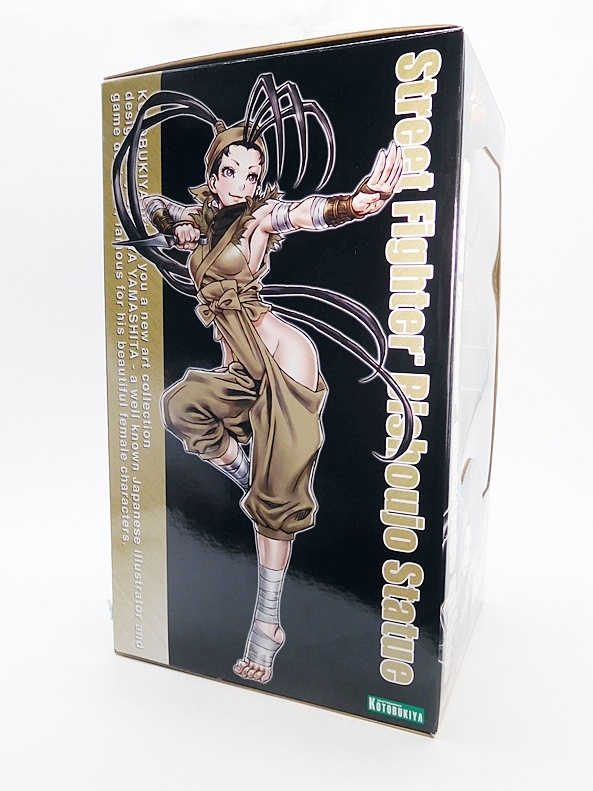 It’s been over a year since I last opened and reviewed one of Kotobukiya’s Bishoujo statues, and it’s been twice as long since my last Street Fighter Bishoujo. I haven’t given up on these wonderful works of art, but with the prices climbing higher and higher and my display space running out, I’ve had to be a little more picky about the ones I pick up. 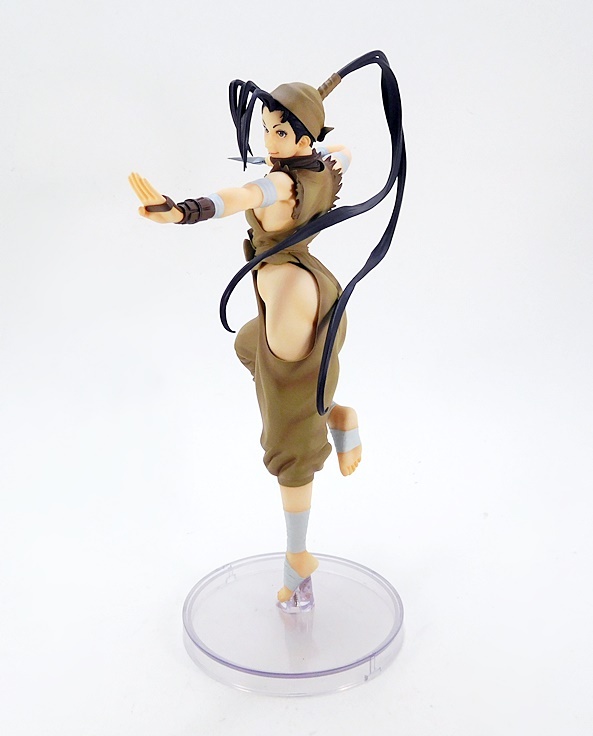 Nonetheless, Ibuki here has been on my want list ever since she was first revealed and I’m lucky that even after waiting all this time, I was still able to get her at a good price. The economy of Kotobukiya on the second-hand market isn’t always so kind. 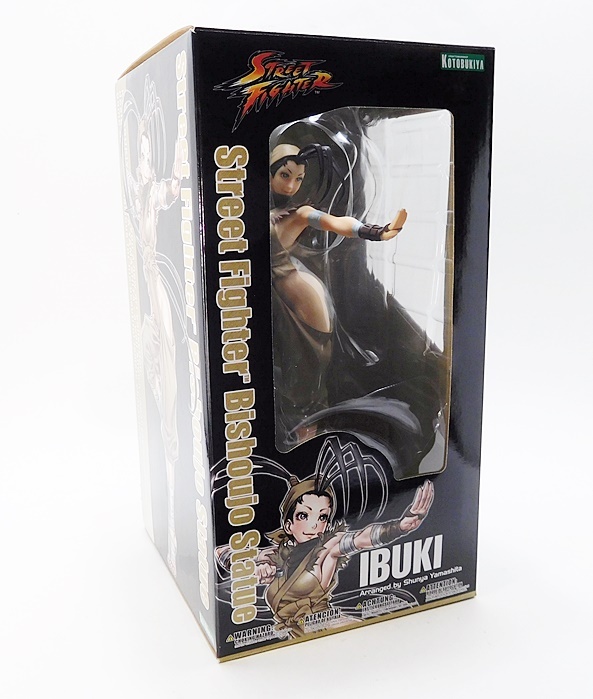 Koto has been using black boxes for the Street Fighter releases, which really sets them apart from the white packaging of the DC and Marvel lines. There’s some wonderful artwork from Shunya Yamashita, on which the statue is based, and you get windows on the front, top, and side panels to let in the light and allow you a good look at the figure inside. 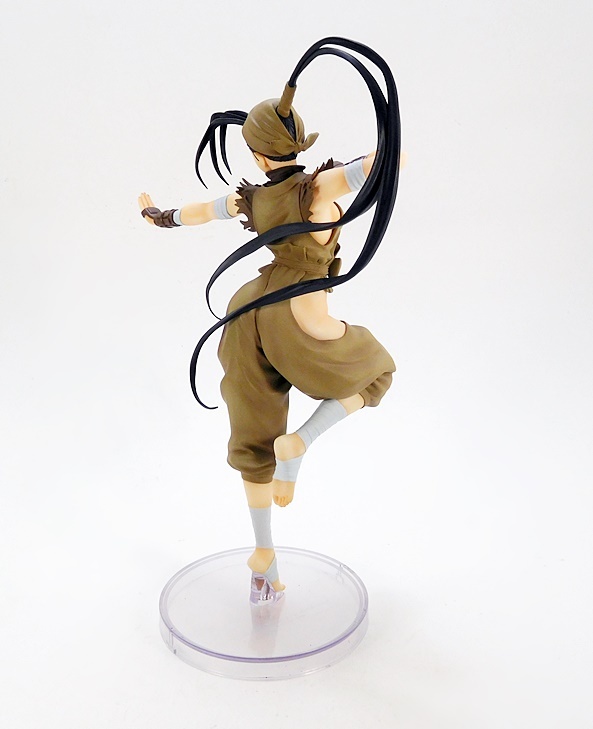 Everything is collector friendly, and the only assembly required is plugging Ibuki’s pony-tail into the back of her head. 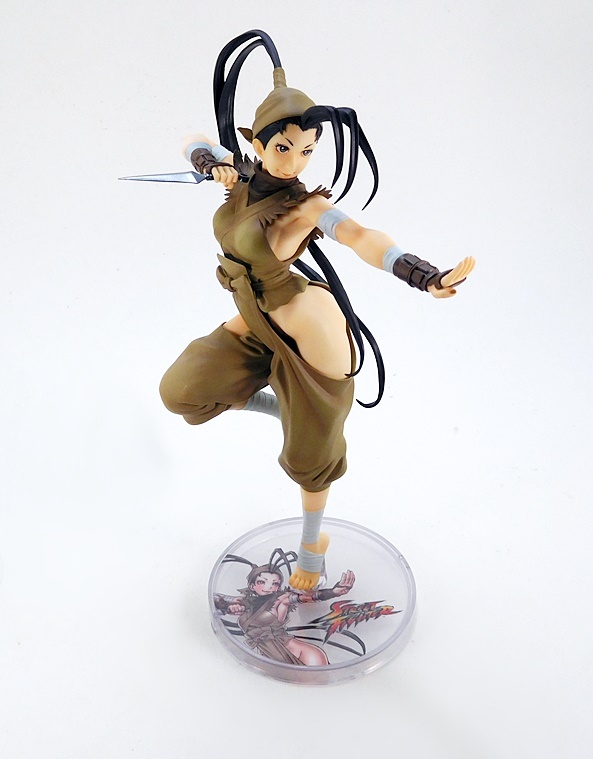 Ibuki made her debut in Street Fighter III and I first encountered her in Street Fighter III: Double Impact on my beloved SEGA Dreamcast, where she became a favorite new fighter of mine. 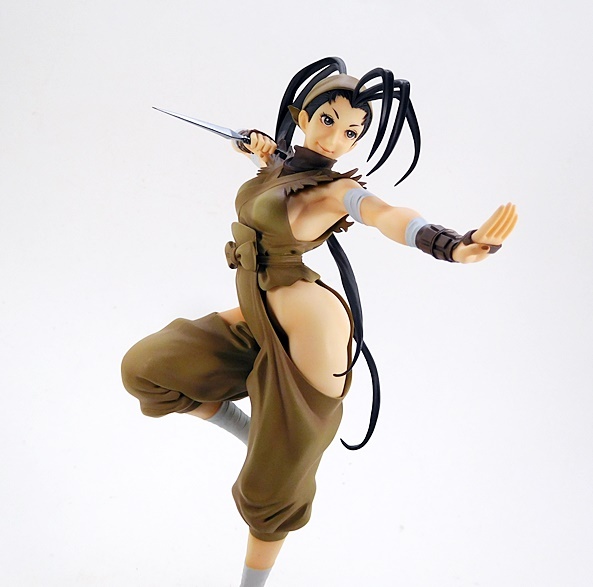 And here’s Ibuki on the scene and looking mighty fine. She stands gracefully on the toes of her left foot with her right leg drawn up behind her. 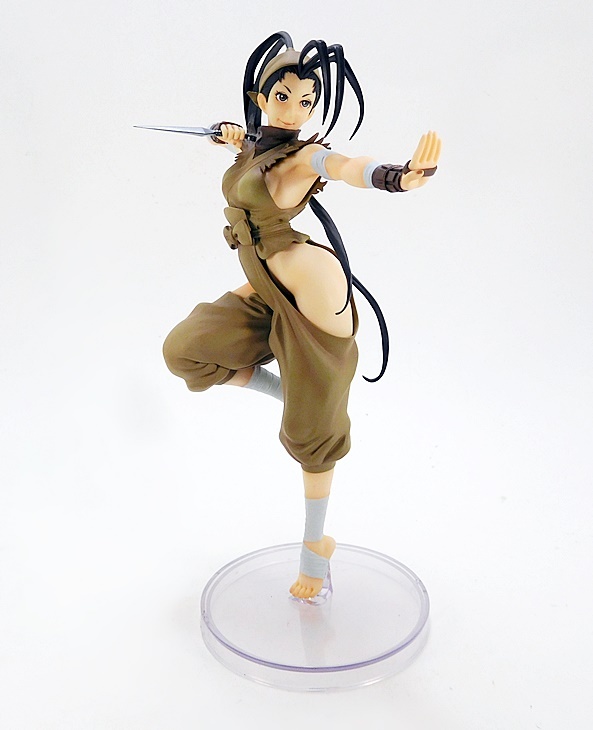 She counterbalances with her left arm oustretched and fingers held up, while her right hand is drawn to her neck, with a kunai, ready to strike. 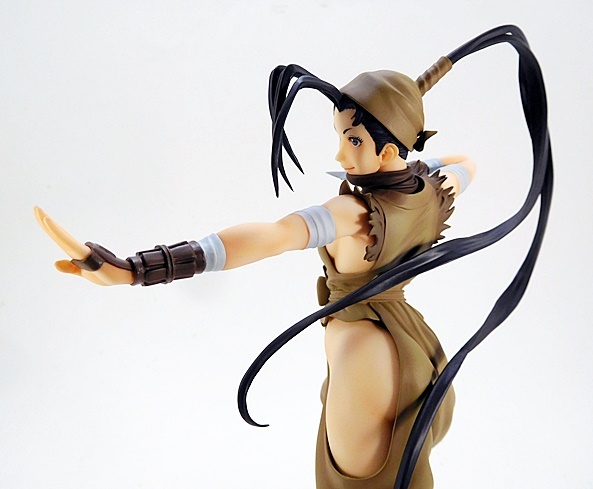 This line has offered some superb poses and Ibuki is yet another example of that. It’s a beautiful mix of elegance and kineticism and I think it captures the character perfectly, while also allowing for a few different “sweet spots” from which to admire her. 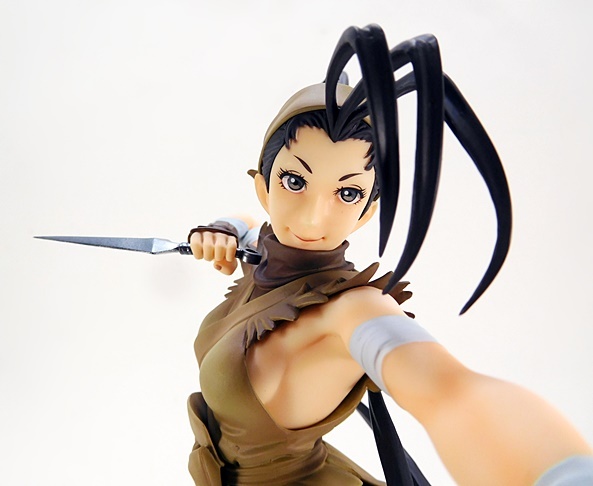 Koto’s Bishoujo statues often tend to feature colorful, glossy, and eye popping decos, and Ibuki here features none of that. Instead, you get various shades of brown, a little white, and a fair bit of skintone. It’s not a criticism, but just a fact of the character’s appearance, which is very faithful to her debut appearance. 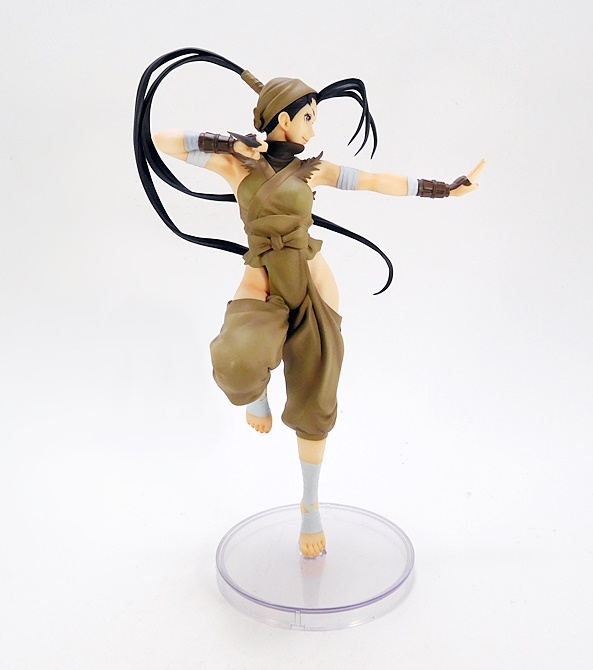 Ibuki is clad in a brown dogi, which consists of a sleeveless top and frayed shoulders, baggy pants with cut-outs at the hips, and which end just below her knees, all tied with a bow at the front of her waist. The outfit is rounded out by a pair of wrist bracers, a tight head scarf, and bandage-style wrappings on her arms and feet. It looks great, and I love the complexity in the outfit’s sculpt. From certain angles it almost looks like the dogi could have been sculpted over the figure itself, and that’s pretty cool. The portrait is excellent. 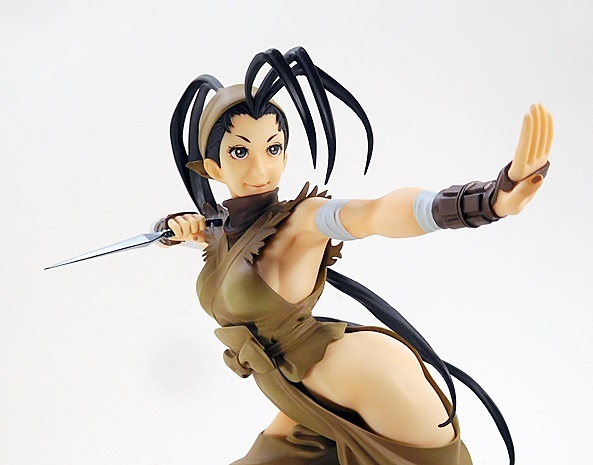 Ibuki offers a confident and playful smile with perfectly printed eyes and painted lips. The real showpiece of this portrait, however, is her distinctive hair. She has three long strands protruding from her window’s peak and hooking forward in front of her face, while two longer strands protrude from her knot-top and arch their way down and across her back. This is my first 3D representation of the character and I wasn’t sure how well this coif would translate, but the wizards at Koto did a fine job with it. 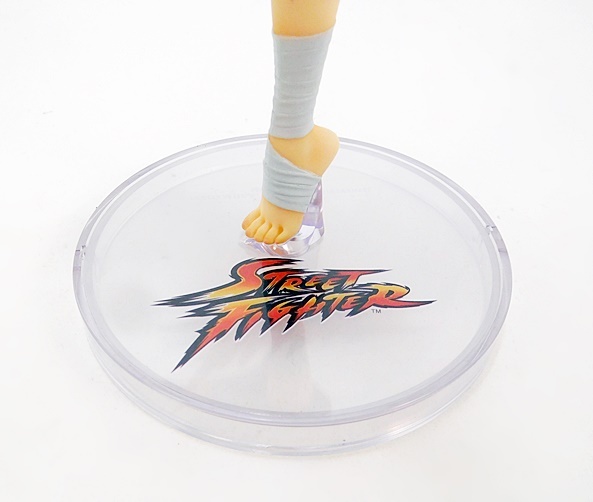 The base is a simple clear disc with a slope to support Ibuki’s foot. As usual, you get two different inserts to display on the base, one is a simple Street Fighter logo and the other features character art. These days I tend to display these statues with the character art, but I think either one looks great. 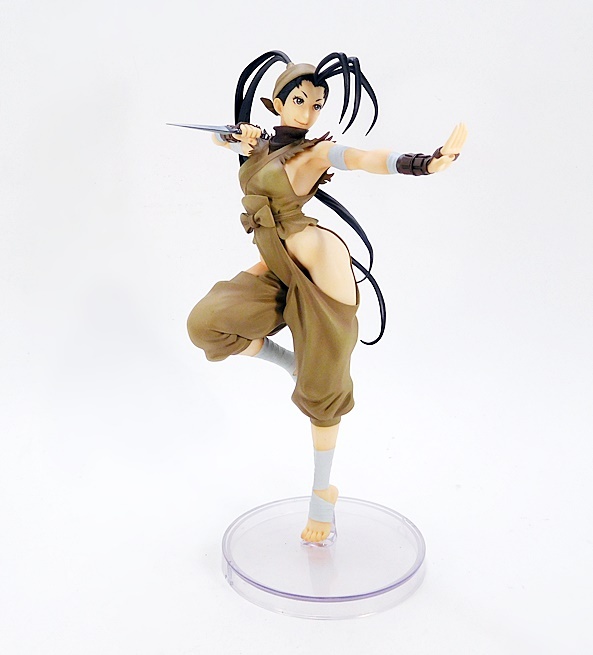 Ibuki here released at just under $60 and I was able to get her for a little bit less. 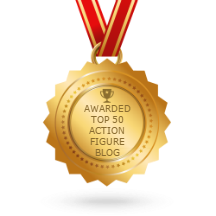 I was often fond of saying that Koto’s Bishoujo line is one of the best values in collectible statues on the market. 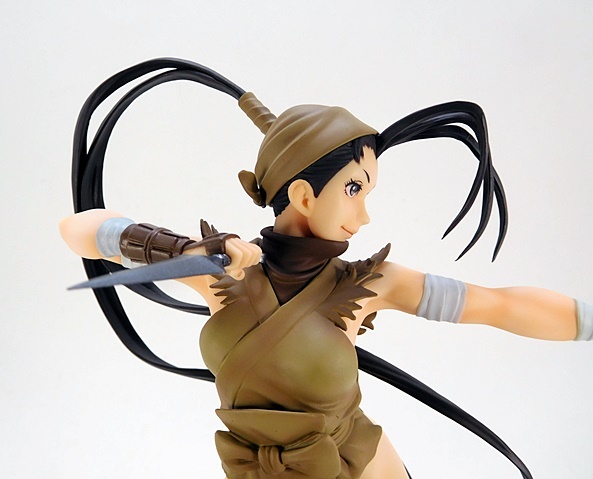 And that was back when you could get a figure like Ibuki for that price. Nowadays, they tend to release in the $70-90 price range, and while I still think they’re worth the price, the sense of good value is rapidly dissipating. I get it, prices go up, but that’s quite a jump, and with so many things competing for my collecting dollar these days, it means that I won’t be able to pick up as many as I used to. 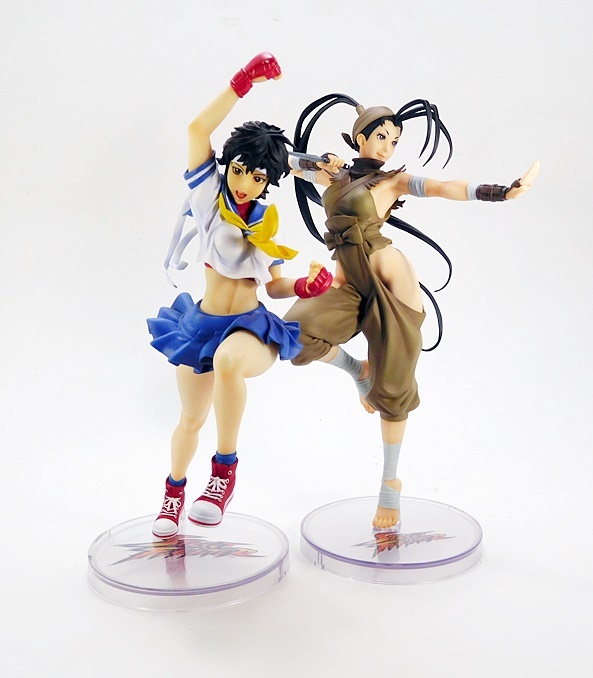 Recently I had to pass on the second versions of Chun-Li and Cammy, but that doesn’t mean they won’t still be turning up here from time to time. Indeed, all Koto has to do is put Elena up on pre-order and I’ll throw down some cash for that release right away!